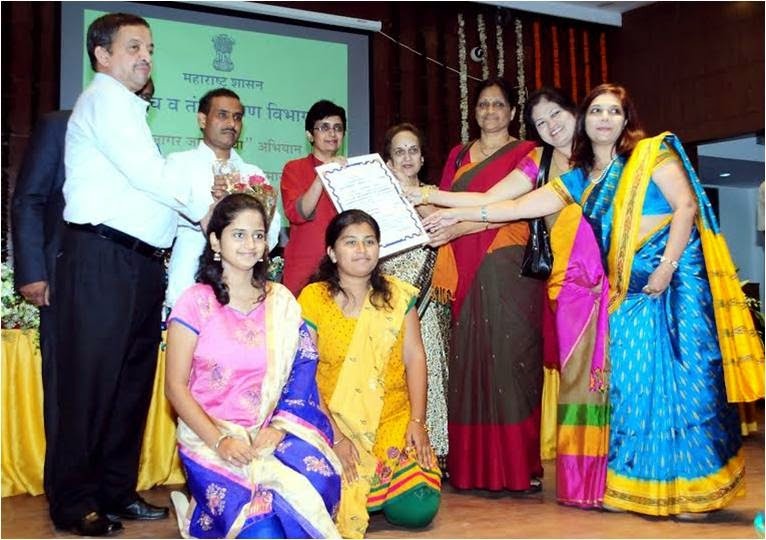 Gogate Jogalekar College has bagged the prestigious district level First Rank Award of Maharashtra Government ’s Jagar Janeevancha programme which is an endeavour to promote gender equality. The felicitation ceremony took place at the Sydhnam college of Commerce and Economics, Churchgate, Mumbai, on 20th August, 2014. The function was chaired by Hon. Minister of Higher and Technical Education Mr.Rajesh Tope. As a part of this programme the government organizes a competition, every year, for the colleges all over the the state to evaluate their contribution to the cause. This year it was GJC to get the honour of winning the first prize at the district level for its immense contribution to inculcate the values of men-women equality and to boost up women-empowerment during the academic year 2013-14. The last year , the college had won the second prize in this competition. Dr. Subhash Deo, Principal of the college was felicitated by Hon. Minister Mr.Rajesh Tope with a cheque of Rs. one lakh, a trophy as well as a certificate. Prof. Shraddha Rane, Coordinator of the Women Development Cell of our college, Dr. Yasmeen Awote, the former coordinator and Prof. Nidhi Patwardhan the member of the cell were present for the function along with Miss Sayali Khedekar and Miss Neha Shewade, two bright girl students of the college. Mr.P.R.Gayakwad ,Director of Dept. of Higher Education; Mr. Balasaheb Kadam, Joint Director, Higher and Technical education, Konkan zone, as well as the well known Marathi actress, Suhas Joshi and Spl. Inspector General of Police Dr. Pradnya Sarawade graced the programme with their presence. The State level inter-collegiate Late Mrunal Hegshetye elocution competition was conducted at the Navnirman College, Ratnagiri . One of our GJCians, Shubham Janardan Jadhav, a student of SYBA, participated in this competition and expressed his views on the topic ‘'Kal Khairlanji….. Aaj Kharda….. Udya kay?’' He successfully achievied the 3rd prize in this competition. Hearty Congrats !!!! The Literary Association our college had organized a poetry recitation competition in collaboration with Bank of Maharashtra on the occasion of 68th Independence Day of India. The selected 21 students participated in this competition. The competition started with an inspirational song ‘Ham Kare Rashtra Aaradhan’. The introduction of the programme was given by the convener of Literary Association, Prof. Shraddha Rane. After Prof. Rane gave a brief idea of the aims and objectives of the Literary Association, Dr. Kishor Sukhatankar, principal in charge inaugurated the programme by presenting a poem of Sopandev Chowdhary which elaborated the creative process of poetry. Mrs. Nisha Kale , a famous compere at the Akashwani Radio Station and Mr. D. R. Walawalkar , an excellent orator and anchor, were the honourable judges for the competition. The participants recited well-known poems in Marathi, Sanskrit and Urdu literature which dealt with the themes of patriotism , social awareness and national integrity. Ms. Sayali Khedekar , a student of TYBA , stood first in this competition. Ms. Sayali Pilankar ( MA-I) and Kiran Joshi (MA –II) won the 2nd and the 3rd prize respectively. Ms. Vaidahi Patwardhan and Ms. Gauri Sawant got consolation prizes. The prizes and certificates were distributed to the winners by the hands of all the guests including the sponsor Mr. Vijay Shrivastav, Divisional Head of Bank of Maharashtra, Ratnagiri. Towards the end, Prof. Danish Gani presented a patriotic Urdu poem. The programme was anchored by Master Kiran Joshi and the vote of thanks was delivered by .Dr. Nidhi Patwardhan. The additional class tests for the FYBA, SYBA and TYBA students will be held right after the Ganesh Festival Vacation, on 5th and 6th of September 2014. The additional test will be for those who , due to some valid reason and with prior permission, could not appear for the class tests conducted during 18th to 24th August 2014. The Vice Principal of Arts Dr. Atul Pitre and the Internal Evaluation Coordiantor of the faculty Prof. T.B. Rokade have appealed such students to appear for the additional tests without fail. Maintaining the tradition of high success rate the TYBA result of the college for the year 2013-14 has been glorious. This average result of the 6 semester pattern has been 91.74% . Total 30 students of the college have secured 'A' grade in their finals. Ms. Bhakti Prakash Sawant ( History and Geography) has stood topper in the college with first rank ( with 6.85 CGPA). Ms. Rama Ramchandra Sohani , (History and Political Science.) and with Ms. Tehsin Kazi , (Urdu and Sociology) have secured 2nd and 3rd rank respectively. The departments of History and Sanskrit have come out with 100% result. Principal of our college , Dr. Shubhash Deo, Administrative Vice Principal, Dr. Kishor Sukhatankar , Vice Principal of Arts Faculty, Dr. Atul Pitre have congratulated all the successful students, with equal appreciation of their teachers for the glorious success . It's the first cumulative result of the credit and grade based semester system which was introduced 3 years ago. Two one-act plays of our college ‘Hiyya’ and ‘Brain’ have been successfully qualified for the final round of the famous inter-collegiate one-act play competition - Purushottam Karandak which was organized by Maharashtriya Kalopasak Sangh , Pune. The final round will be conducted in December, 2014 in Pune. In this Kokan Divisional competition, various colleges from Ratnagiri , Raigad and Sindhudurg participated. The play ‘Brain’ is based on the psychology of terrorist organizations. Written and directed by Mr. Nilesh Gopnarayan the play bagged 2nd prize and master Swanand Desai, a student of TYBcom , won the prize for the Best Actor. Manthan Khandake , Sneha Ayare , Vidhisha Mhaskar and Deepak Mangaokar were other participants in the play. The play ‘Hiyya’ presents the life of un-organized labourers who stand poles on roads. This play received the 3rd prize. Manoj Bhise , Sujit Mestri , Akshay Chalake , Shilpa Kamble , Rakesh Velye , Yatin Pawar and Pooja Salvi were the participants in the play. The Principal in charge of our college, Dr. Kishor Sukhatankar , Dr. Atul Pitre ( VP , Arts) , convenor of co-curricular activities Prof. Uday Bodas and Head of the cultural department Prof. Anand Ambekar have congratulated all the winners. Hearty congratulations to all the participants and wish them a huge success in the finals. In collaboration with the Literary association the Sanskrit Department of our college observed the Sanskrit Day’ on 8th August, 2014. On this occasion the department organized a "Manuscriptology workshop" during 5th to 7th of August , 2014 under the guidance of Dr. Siddharth Vakankar, a scholar in the field of manusciptology. The workshop was inaugurated by Pricipal Dr. Subhash Deo. Dr. Kalpana Athalye, Head of Sanskrit Dept., Dr. R. H. Kamble, Head of History Dept., and Dr. Atul Pitre, Vice Principal of Arts faculty were present for the inauguration ceremony. 70 participants, including students of Sankrit and History Departments as well as the lovers and learners of Sankrit language all over Ratnagiri attended the workshop to get excellent guidance from Dr. Vakankar for studying the ancient manuscripts in Sanskrit language. The resource person, Dr. Vakankar was honoured and the beneficiaries of the workshop were felicitated for their active participation on 8th August, 2014. On the occasion of Sanskrit Day. Dr. Vakankar delivered a lecture on the topic ‘Sanskrit and other Indian Languages’.He was welcomed by Dr. Atul Pitre as a chair-person of the Sanskrit Day programme. Prof. Shraddha Rane, Convener of the Literary Association and Dr.Kalpana Athlye, Head of Sanskrit dept., were present on the dais.Dr. R.H.Kamble, Dr.Chitra Goswami, Dr.Nidhi patwardhan , Prof. Danish Gani, Prof.V.M.Athalye ,Prof. S.N.Gopale and many other teachers and students of languages were present for the event. Life…. We have heard this word a number of times. Right from the vocabulary of a common man to the most experienced scientist. But actually what is it? What’s life? Is it the morning sunrise or the downing sunset or is it the moon with the twinkling stars? Well, if we make a keen observation, then life is something which is more precious than a pearl. And damn luckily we have got a chance to live it. Life is just a mixture of happiness and sorrow which is to be lived in every breath. God has endowed us with such a beautiful gift but in the day to day hustle bustle we are unable to live it. We fail to recognize its importance. Our whole day moves along with needles of the clock and again, ready to windup for the next work. But do we stop for a moment and ask what are we doing with our life and where are we?? If you will ask this question to yourself then surely you will get some response, because you cannot lie to yourself. If you are living your life for a purpose then you are on a right track, if not then think about it at this very moment and decide. Get it to know your purpose and along with enjoy your life. One more thing to add about life : don’t live it just for yourself, sometimes try to live it for others too. Think of their happiness, their sorrows. Try to keep others happy and unknowingly you will also be happy. People say, every human being on this earth gets a chance to live life only if he has done several good deeds. It must be true also, because such a divine gift couldn’t be received without any efforts. So if you have got it, then live it in every breath, don’t put it on tomorrow. Live for today and at this very moment. No one has seen the future; you may or may not be alive. Thus these are the moments, live it and enjoy your life, may be with happiness or with sorrow. It does sound strange but that is the truth.…! Otherwise, though our departments ,our subjects are not common ,we all meet together , enjoy and share everything but when exams arrive, chatting subjects take a turn to ‘when will be our extra lectures ?’, ‘Is there any question bank given?’ ,Have you got any notes of this chapter?’.... During exam times those who have answers to our questions , become our friends (only for exam time J). Whenever anyone has some work or want to share something, then everyone has an SMS pack, a net pack and whenever we get a chance to chat we don’t miss it. But during exams it's like , NO NET , NO SMS… ONLY STUDY….. This exam fever doesn't only affect the students , but also the teachers. Because during this period there is no chance of off lectures or to even bunk a few. All their teaching is strictly exam oriented. Otherwise teachers, rarely ask us about notes but only for exams we receive lengthy notes and big big books and heavy loads from them. Now please don't say that it is the mistake of we ,the students. Students have to take notes from time to time, then get it checked from teachers…… if they study well they won't have to face these problems. But even if we work regularly , teachers give us question banks only during exam periods and say that we got to answer our exams from a particular approach or framework or pattern if we want high grades. Friends, changing exam system is also somewhat responsible for this. As an aftereffect of these changes, we have to face this. Mainly this exam system doesn’t check our intelligence or abilities, it only checks our parroting. These exams are not only for classes but even for masses. Shouldn’t this be considered??? So please everyone give it a fine thought and save us……..